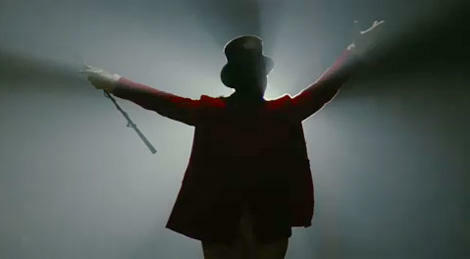 On the surface, Water For Elephants is a classically-made film. One part fantasy, one part adventure, and one part love story. It stars that young heartthrob kid from the Twilight movies (Robert Pattenson), that ingenue chick who won an Academy award for Best Actress, and that German guy who won Best Supporting Actor for his portrayal of an evil Nazi in Inglourious Basterds. From the look of the trailer, it would seem none of them were really breaking type or hitting out of their wheelhouse. How the movie actually plays out, however, is something very different. Water For Elephants isn't a movie about following your heart or fighting against all odds to win the unending affections of your one true love. It is a movie about lust, sadness, and despair and the lengths to which a person will go fueled only by those base emotions. Robert Pattinson plays Jacob, a young and naive man with dreams of becoming a veterinarian and well on his way to graduating from Cornell University. Tragedy strikes and he instantly becomes a man with no future and no direction. 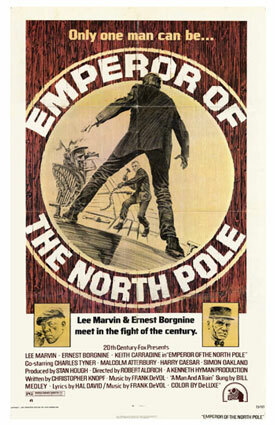 He soon stumbles, quite literally, onto a traveling circus and thinks that his future may lie with it. At this circus he meets and befriends the beautiful star attraction, Marlena (Reese Witherspoon), along with the road-hardened and maybe evil/maybe misunderstood ringmaster, August (Christoph Watlz)...who also happens to be Marlena's husband. You can already use the context clues to hypothesize where the film is going to go from here. Have no fear, it does eventually end at that particular destination but it takes a road less traveled to get there. All of the characters are well-drawn and more than adequately realized by the actors (especially Watlz), but the relationships between them are murky at best. The traditional narrative would have you believe that Jacob and Marlena fall in love and break free from the tyrannical rule of August and his freak show. Director Francis Lawrence instead chooses to shroud the film with a steadily growing dark tone. When Jacob first hits the circus it seems like a fantasy land full of opportunity, wonder, and mystery. As he falls deeper into the rabbit hole, the audience is able to more clearly see not only the flaws and cracks in Jacob's new world, but in Jacob himself. There is really no interaction between Jacob and Marlena that leads the audience to believe there is any form of love between the two of them. Jacob is young, lost, and easily impressionable. He never really stands up for himself, but he demonstrates early on in the film that he will do what he can to undermine August as long as he feels what he is doing is just. Marlena is in a similar situation. She has grown up as August's wife. He can be cruel to her and the film infers that he is physically abusive toward her, but she isn't without flaw. She is growing older and her place as the center of attention may be fading. She sees the way this younger man is looking at her and reciprocates his lust. There are several small exchanges between Marlena and August that clue the audience in that maybe this affair with Jacob isn't the first time she's strayed. Finally, we come to August. He is by no means a good man, but he isn't the personification of evil that films like this usually use for an antagonist. It needs to be mentioned that Christoph Waltz plays August with such intensity and fury that he completely steals the show. The movie takes place deep in the throes of the Great Depression. August's way of life is dying and he is losing money. Circuses are dropping all around him. He is a desperate man in an increasingly desperate situation. He feels that he must do what has to be done in order to survive. There are moments in the film where he clearly understands that he has become a monster and glimpses of his former self shine through. You don't hate August, you pity him. You have pity for all of them. They are all damaged characters clawing for a way out. If what you're more in the mood for is a dark fantasy with a real and tangible love story, look no further than Moulin Rouge. 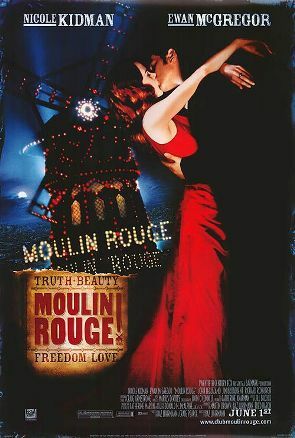 Other than Moulin Rouge being a musical, the two films are actually very similar. They both deal with "freak" shows (a circus and a brothel), both are about a young man that stumbles into the crazy show-business world, and both movies have a larger than life antagonist to whom the object of the young man's affections already belongs. Both films even have elephants...only in Moulin Rouge the elephant is Nicole Kidman's house. Oh yeah, and both main characters have best buddies that are midgets. Elephants. Such a classic plot device used in all manner of movies both good and horribly, horribly bad. 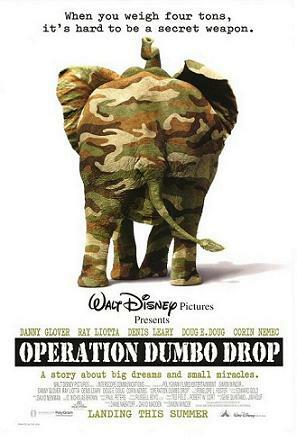 Out of all of the cringe-worthy elephant movies that I can think of the one that most perplexes me is Operation: Dumbo Drop. This isn't just because the movie is god awful, but also because, as a kid, I really liked it. I like to think that even as a child I had good taste, but then something like Operation: Dumbo Drop creeps back into my life and I realize that was not the case. The premise of the movie is as simple as it is idiotic: During the Vietnem War an elephant is murdered just before a big festival. This elephant is crucial to the festival so the US Army decides they need to replace it. They recruit a crack team of comedians...I mean, soldiers to transport the elephant through enemy lines in time for the festival. Hijinks ensue, and the elephant saves the day. Awesome.